Are Fund Houses Opening Up Their NFO Factories Again? Home > Financial News. Simplified. > Are Fund Houses Opening Up Their NFO Factories Again? According to the Ministry of Statistics and Programme Implementation (MOSPI), India recorded 4.3% industrial growth in August 2018. This was an ordinary show considering that Indian economy grew 8.2% in Q1, FY 2018-19. The performance of the Indian mutual fund industry has been worse. The Indian mutual fund industry has reported a 5.2% fall in Asset Under Management (AUM) between April 2018 and September 2018. Nonetheless, Systematic Investment Plans (SIPs) recorded a healthy growth of 15.5% in monthly collections during the same time period. As you may be aware, equity markets have been jittery throughout 2018. Bellwether indices such as CNX Nifty and BSE Sensex have incurred double-digit losses and midcap and smallcap indices have experienced more damage. Debt markets are grappling with unique problems with important financial institutions systemically defaulting loans. Not so surprisingly, the cooling growth rate has made mutual fund houses restart their New Fund Offer (NFO) factories. Falling growth and overworked NFO factories—does it look like an odd combination? Due to deteriorating market conditions, the mutual fund industry has lost over Rs 1 lakh crore of AUM from the beginning of FY 2018-19 to September 2018. Mutual fund industry earns its revenues by charging you fees on the market value of your investments. In other words, when the AUM decreases, fee income earned by the mutual fund industry goes down and vice-a-versa. Some big Asset Management Companies (AMCs) are publicly listed now; while a few others are promoted and run by publicly listed companies. For all these AMCs, it's important to show steady growth in AUM to keep their shareholders happy. They are launching NFOs across all categories and trying to garner fresh funds at a time when there is a tiny crunch of money in the system. In FY 2018-19 so far, the mutual fund industry has collectively launched 84 schemes, of which some are still open for subscription. The ones that have disclosed their first portfolio have added Rs 37,750 crore of AUM. It's noteworthy that 46 schemes are equity oriented. Among newly launched equity mutual fund schemes, 24 schemes have been close-ended schemes. Mutual funds seem to have taken undue advantage of close-ended schemes given these aren't as stringently regulated as the open-ended schemes. Shockingly, some thematic funds such as ICICI Prudential Pharma Healthcare & Diagnostics (P.H.D) Fund, Sundaram Services Fund, and ICICI Prudential Bharat Consumption Fund-1 garnered the AUM of nearly Rs1,000 crore respectively. 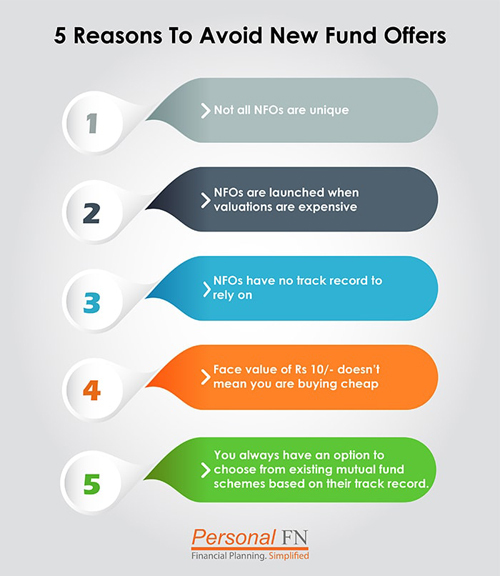 Why Are NFOs attracting money despite investors being well-informed? Mutual funds houses have been playing smart. Unlike in the past several occasions, they aren't coming to the market only when the equity indices are scaling new highs. This time, they are hitting the markets, when the broader markets are down and many smaller companies have fallen over 35%-40%. Also, some sectors are undergoing structural changes, while others are trading at multi-year low valuations. The conditions are conducive to convince investors that they should take advantage of the current market volatility and invest in NFOs which have no baggage to carry. Unlike that of existing funds, fund managers of NFOs can devise a fresh strategy for deploying money garnered through NFOs. Mutual funds with strong distribution networks and sound balance sheets are using their muscle power to push their NFOs aggressively. If you are falling for their sales pitches, you are making a grave mistake. Markets, in general, are still expensive. Despite a sharp fall, midcap and smallcap are still expensive in particular. The world is facing too many uncertainties and just price corrections may not be good enough to bet big on the markets. Mutual fund houses are pushing risky propositions through close-ended funds. Scheme duplication is perhaps at its best in close-ended schemes. They aren't open for regular subscription. In other words, the SIP mode option is non-applicable. They lack the track record. You have no option but to trust the mutual fund house and the fund manager managing the scheme. No matter how poorly they perform, you have no option but to remain invested in a close-ended fund. They lack flexibility. Many of them list their units on exchanges. Since they are illiquid most of the times, it becomes unviable at times to buy or sell on the exchange. Close-ended schemes operate at higher costs as compared to the open-ended schemes. There's no concrete evidence to prove that close-ended schemes are superior to the open-ended schemes. However, there have been instances where close-ended schemes have performed miserably. You need to outsmart opportunistic fund houses that want to grow their AUM at the cost of your hard-earned money. Not all fund houses are alike. Many of them systematically manage their assets and put investors' interest at the fore. They don't launch NFOs frequently and care about the performance of all schemes under their management. Therefore, while selecting a mutual fund scheme, you should pay close attention to the traits of a fund house. This includes its ideologies, rationale behind launching the fund, whether the fund is unique, and the investment processes & system at the fund house, besides other quantitative factors. And before you invest in any mutual fund scheme, ensure that your investments are in line with your financial goals and take into account your risk appetite and time horizon. Needless to say, personalised asset allocation is a necessity and the reference point of any investment plan. To outsmart the sales force of mutual fund houses and the gang of agents and distributors, you need to know the nitty-gritty of personal finance. That's not all. You should also keep yourself abreast with the latest developments in the economy and the industry. Wondering whom to approach to acquire knowledge and gain insights? Sign up for PersonalFN's comprehensive A to Z e-course to Become Your Own Financial Planner. With this e-course, you too, can create a financial plan like an expert. It will guide you in the most serious decisions regarding money matters. The tutorials start with the basics of budgeting and managing cash flows and then moves on to how to set SMART goals. You will also learn how to select winning mutual funds, along with the right asset allocation and its importance. The modules will also outline strategies to build your optimum investment portfolio and much more. Apart from the video tutorials, you will get access to a host of downloadable calculators, such as a Cash Flow Calculator, Retirement Calculator, etc. absolutely free! Don't miss this opportunity. Subscribe to the e-course now!